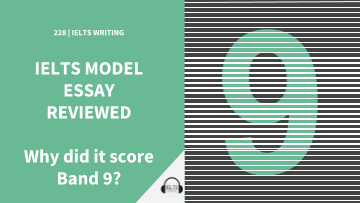 Below we have a Band 9 essay graded by an ex-IELTS examiner. First you can read the essay, and after we break down which sentences helped this essay score a Band 9. Each criteria has been considered and the sentence in the essay has been colour coded to correspond to the four marking criteria used by the British Council / IELTS IDP. Online education and training is becoming increasingly popular in the business world. Do the advantages of this development outweigh the disadvantages? Enthusiasm for digital technology is at an all-time high, not least in the workplace as companies around the world turn to internet-based training to keep their employees abreast of all the latest developments. As with all new trends, there is some debate about whether this transition is for the best. One key reason for this move away from more traditional training methods is the fact that e-learning offers businesses the opportunity to reduce their expenditure significantly. Providing face-to-face training can be exorbitantly expensive, particularly in terms of travel costs and lost productivity, and online courses can greatly reduce the expense of keeping employees well-informed and up-to-date. Computer-based training renders geographical location irrelevant and this eliminates the need to pay an instructor to travel to your office or cover the cost of sending your employees to a training centre. It also minimises the amount of time wasted. From a purely financial perspective, there is no doubt that this shift to digital learning makes perfect sense. However, research suggests that the quality and effectiveness of web-based courses lag behind the efficacy of those delivered in a classroom setting. People crave interaction and while digital training courses may offer a welcome addition to a company’s professional development plan, many educators believe that they should be used to complement rather than replace instructor-led sessions. Some subject matter such as compliance training is well-suited to an online format whereas management or leadership courses which are more collaborative in nature, are best taught ‘in person’. Many companies are starting to implement ‘blended learning’ programmes which aim to combine the best of both worlds. In conclusion, although the rise of computer-based education is very attractive in terms of reducing overheads, for the moment at least, more traditional training still has its place in the workplace. The challenge for businesses is to find the right balance between the two. Enthusiasm for digital technology (LR1) is at an all-time high (LR2), not least in the workplace (CC1) as companies around the world turn to internet-based training to keep their employees abreast of all the latest developments (LR3). As with all new trends, (CC2) there is some debate about whether this transition is for the best (TR1). One key reason for this move (CC3) away from more traditional training methods is the fact that e-learning offers businesses the opportunity to reduce their expenditure significantly (TR2) / (LR4). Providing face-to-face training can be exorbitantly expensive (LR5), particularly in terms of travel costs and lost productivity, and online courses can greatly reduce the expense of keeping employees well-informed and up-to-date. (GR1) Computer-based training renders geographical location irrelevant (LR6) and this eliminates the need to pay an instructor to travel to your office or cover the cost of sending your employees to a training centre (TR3). It also minimises the amount of time wasted. From a purely financial perspective, there is no doubt that this shift to digital learning makes perfect sense (GR2). However (CC4), research suggests that the quality and effectiveness of web-based courses lag behind the efficacy of those delivered in a classroom setting (CC5) / (TR4). People crave interaction and while digital training courses may offer a welcome addition to a company’s professional development plan, many educators believe that (GR3) they should be used to complement rather than replace instructor-led sessions (TR5). Some subject matter such as compliance training is well-suited to an online format whereas (CC6) management or leadership courses which are more collaborative in nature, are best taught (GR4) ‘in person’. Many companies are starting to implement ‘blended learning’ programmes which aim to (GR5) combine the best of both worlds (LR7). In conclusion (CC7), although the rise of computer-based education is very attractive in terms of reducing overheads (LR8), for the moment at least, more traditional training still has its place in the workplace (GR6). The challenge for businesses is to find the right balance between the two (TR6). How can I improve it? I need more than 7. Hi Nilufar! Check out https://www.ieltspodcast.com/essay-correction-service/ for high-quality IELTS essay correction. Or if you sign up to the IELTSPodcast email list, you will get our emails to ask questions about IELTS, and a special offer for essay correction. So great, I wish there will be more as good as this essay. Glad you liked the tutorial, May! We’ll post more essay tasks like this in the future. Stay tuned! Thank you for your effort. Can we have task 1 explaination and marking in the same way? If you can that would be very kind if you. Thanks for your suggestion, Dinah! That is on our list and will publish a complete tutorial for Task 1 soon. Are you taking the General or Academic exam? I am taking IELTS Academic. I appreciate the systematic methodical way of presentation of details of this essay. I am looking for more essays and explainations. Will wait for further essay tasks. As quality of any website could not be judged from a single task. However, above example essay was excellent. Hi Rise! We’ll definitely produce more essay tasks with comments. Are you going to take the exam soon? You’re most welcome, Munawwer! What band score are you aiming for? Thanks for the wonderful essay. Many test takers are not able to achieve 7band in writing. You being a former IELTS examiner, please let us know the common mistakes test takers make to secure 7 in writing. I sincerely appreciate for the great post. If there are more essays and comments from the examiner already in this page, let me know where can i get them. We’ll surely do, Soo. Thank you! All good and well, but I believe the fundamentals have not been addressed. For example, it was not clarified what type of essay this is. I believe there are five different types of essays, all requiring a different format. As an example, an opinion essay requires a different structural approach to a discussion essay, which I’d the basis for developing what has already been analyzed in this example. Thanks for the honest feedback, Lesley! We’ll definitely consider that.